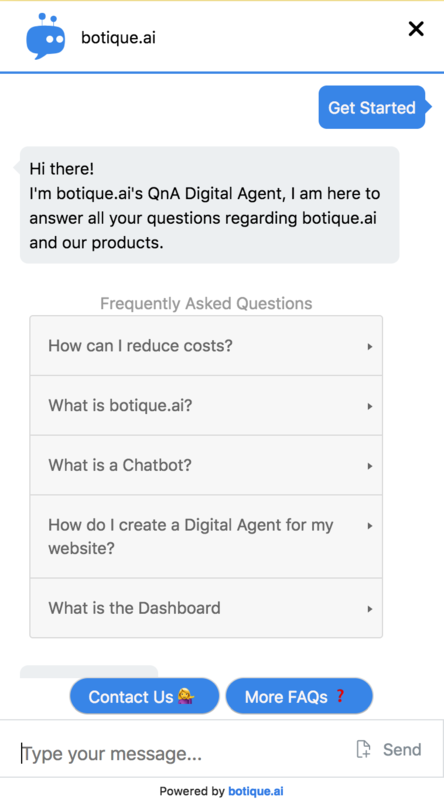 NEWARK, N.J., Oct. 3, 2018 /PRNewswire/ -- botique.ai Inc., the leading Conversational Artificial Intelligence Company, announced the launch of its new AI-powered Chatbot platform that allows businesses to add intelligent and conversational features to their customer engagement channels. One of the Key features of botique.ai's plug-n-play Chatbot platform is that training and deploying the AI-powered Chatbot can be done in a matter of minutes and with absolutely no technical background. In today's competitive digital culture, businesses struggle to keep up with consumer demand for instant and accurate support at all times. Consumers, especially Millennials, demand messaging options. Although more businesses are adopting Chatbot solutions over time, many Chatbot platforms aren't up to the task, and need to be way smarter in order to be of a benefit to business goals, meaning, they need to be able to use powerful AI algorithms to engage, convince and answer customers, resolve issues, or conduct tasks, integrate with enterprise systems (CRM, Knowledge Base systems, Billing systems, etc .. ) and leverage big data. 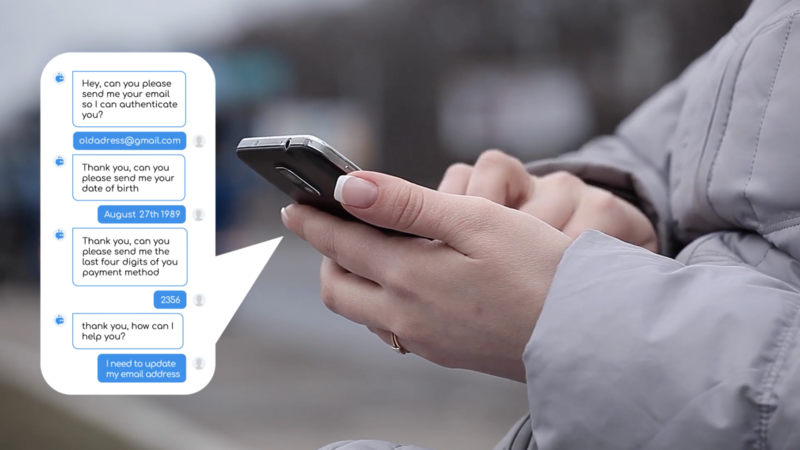 botique.ai Question Answering AI Powered Chatbot platform is designed to optimize real-time communications for businesses by handling the "time-consuming," repetitive and oftentimes redundant questions that are handled by human agents, using popular messaging platforms like Facebook Messenger, online web applications, businesses can now automate conversations with customers to help them self-serve, in addition to providing a tool to re-engage bouncing traffic on businesses' websites and to collect leads. "The new 'Chatbot as a Service' platform enables businesses to deploy AI-powered Chatbots for Customer engagement in a few steps, without the need to write any line of code, or to dig into archived data and conversations history to train the AI," said Yoav Yanovski the company's CEO and Co-Founder. "Even with no exposure to programming, businesses can easily deploy a natural language processing (NLP) powered Digital Agent using our wizard, import & connect the business content and publish the Agent to a Website or Social Media channel with a single line of code. botique.ai identified a gap between Goal-Oriented Chatbots that follow a "finite-state dialog flow" that fail to provide a proper human experience and AI-powered Chatbots that require heavy investment in building and training the AI. That's where botique.ai steps in, providing the power of Pre-trained AI modules and NLP algorithms, with an easy to use interface. "As one of the leading Conversational AI companies, botique.ai believes that both businesses and Customers shouldn't waste time or effort finding information about products or services, processing standard requests, or accomplishing simple tasks," said Rajai Nuseibeh, head of Marketing at botique.ai. "Thus, we made it our mission to develop the text-based AI-powered service, with the (pre-trained) NLP & NLU algorithms needed to understand users' intents, provide the needed information, using a very simple User Interface." botique.ai invested in building and training the AI algorithms that will bring businesses the power of conversational AI with a simple, easy to use interface, helping businesses adopt an affordable and easy to use solution to optimize their Customers' Experience, paving the way to fellow AI companies to take this technology forward. 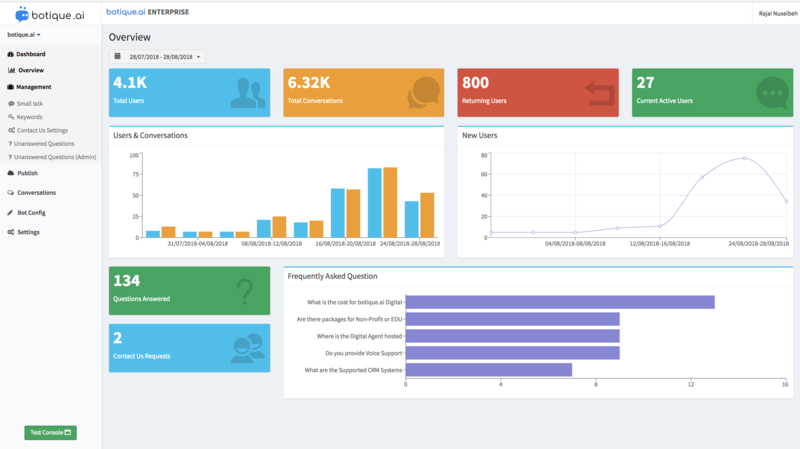 The QnA AI-powered Chatbot platform provides Multilingual support, QuickPredict feature for Keywords and alternative question suggestion, a comprehensive dashboard for customizing and managing several Chatbots, importing and editing features, a Built-In Live Chat component for seamless handover between AI and human agents, in addition to real-time analytics and reporting support. The Chatbot Platform service is offered with a 30-Day Free Trial period (No Credit Card/Payment needed for the trial).